Giant corporations and the wealthy are naturally united in their hatred of the $15 minimum wage. Surprising, however, is the strong opposition sometimes encountered by workers who make barely above $15 an hour. The anti-$15 logic of these workers varies. Some simply repeat the misinformation they hear on the media, that a higher minimum wage would cause mass inflation and unemployment, regardless of the fact that, according to the U.S. Department of Labor there is no evidence to support these claims. Some workers against $15 say such an increase isn’t fair, since they haven’t had a raise in years and have worked hard to get what little they have. Unfortunately, it’s becoming increasingly untrue that people “get ahead” when they work hard. The economy has fundamentally shifted in the last 30 years to the point where the average fast food worker is now 29 years old. Opportunities to earn a living wage have shrunk exponentially. 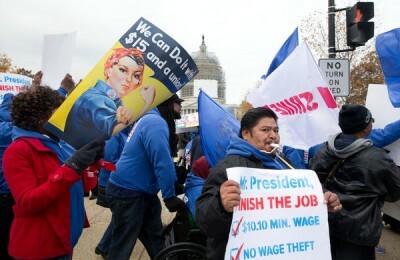 According to a recent study 43 percent of the U.S. workforce earns under $15 an hour. There are simply not enough high wage jobs to leap into; the leaping is now going in the opposite direction. Regardless of their reasoning, the anti-$15 workers are arguing against their own best interest, since a $15 minimum wage would benefit the overwhelming majority of people who make over $15 an hour. This is because a $15 minimum wage would transform the labor market in favor of all working people. Economists have even given a term for this phenomenon, called “compression,” which describes the effects of how rising lower wages puts pressure on employers to raise wages for higher paid workers, marking a shift in the labor market. Even if an employer doesn’t give into the pressure of the labor market and raise wages immediately, a $15 minimum wage would give workers making over $15 enormous leverage to demand such a raise, since they could easily prove by market comparisons that they’re being underpaid. Feeling empowered to make demands is the first step towards achieving them. The labor market works a lot like other commodity markets, and is affected by supply and demand (for example unemployment) as well as regulation (like the minimum wage). Of course, the labor market is different in that humans can demand higher prices for themselves, where widgets can’t. A higher minimum wage drives all wages higher in the same way a low minimum wage drives wages lower. For example, when one company lowers wages, other companies often follow suit. If a couple of large companies lower wages at once, the market begins to shift, since workers have less opportunities to find higher wages elsewhere. The workers either fight to maintain their wages usually by forming a union or succumb to their new, lower wages, which quickly form a new equilibrium for the labor market in that industry, affecting other industries indirectly. No workers’ wages are safe if they are surrounded by low wage workers; islands of high wage workers are always targeted in such an environment. It’s only a matter of time. In the same way that corporations are constantly striving to lower wages, it’s the job of unions to raise them. It was not the good grace of the corporations after World War II that created a U.S. working class able to purchase cars and homes, but a strong union movement that raised the price of wages to such an extent that the market was altered in favor of all working people, union and non-union alike, since employers had to raise their wages to compete for workers who would otherwise have gone to work for the unionized company. But the post-World War II wages were smashed by the Reagan administration that sought to re-align the labor market in favor of the employers. Reagan knew that by attacking unions he would be able to lower the wages of all workers, and this attack on unions has continued ever since, creating massive income inequality in the process, regardless of whether the Democrats or Republicans are governing. The wealthy often argue that a $15 minimum wage would cause harm to workers by ruining small businesses and causing layoffs. Again, there has been much study and little evidence that raising the minimum wage causes unemployment. This isn’t to say that all businesses would flourish under a $15 minimum wage. It’s true that some small businesses would fail, but it’s also true that others would flourish with new customers, expanding and hiring in the process. Some entrepreneurs will capitalize on a $15 minimum wage, in the same way that some businesses thrived, like Google and other companies, when regulations were placed on Microsoft to curb its monopoly power. When the economy is stagnant due to monopoly control or because consumers are too broke to afford to consume new regulations, like breaking up monopolies or a $15 minimum wage, can reinvigorate the economy. The U.S. economy is constituted by 70 percent consumer spending. Raising the national minimum wage would inject as much as $450 billion in the U.S. economy each year, money that entrepreneurs would have the opportunity to chase after. Corporations always scream economic Armageddon every time they are threatened with a new tax or regulation. But taxes on the wealthy were 90 percent under several presidents and were only substantially lowered once Reagan came into office. The corporations are screaming because their profits are affected, not because the economy as a whole is in danger. The economic arguments in favor of a $15 minimum wage pale in comparison to the human arguments. No one deserves to live in poverty. The last 30 years have drastically skewed labor relations in favor of the employer, lowering workers wages, health care, pensions, and job protections in the process, creating massive poverty and economic uncertainty. This dynamic is now considered “normal,” where 30 years ago it was considered a radical anti-worker ideology. A $15 minimum wage is the quickest, most direct route to empower working people, and directly intervene into the labor market on the side of the workers. We cannot allow people to say that $15 is too much, when the focus should be on how ridiculous the current minimum wage is. Unions and community groups have the power to achieve a $15 minimum wage if they prioritize their resources and work collectively. Half of the states have voter initiative measures, a process that could begin immediately. If unions want to prove themselves relevant to non-union workers, they have no better opportunity than the “Fight for $15.” By winning $15 for everyone, unions will be less vulnerable to the rhetoric of the “overpaid” union worker, since lower wage workers will see a boost in their pay due to the work of a union-led campaign. There’s no reason to settle for less than $15.